In the July issue of Generally Speaking, University Advancement announced that the Annual Fund reached a record of $10,560,113 and benefited from the participation of more than 51 percent of undergraduate alumni. The 2016-2017 results represent a 2.4 percent increase over 2015-2016 and include record amounts given by undergraduate alumni, law alumni and parents. Overall, W&L received $37,234,582 in new gifts and pledges, representing an increase over last year’s results of more than $9 million. Alumni Affairs supported 67 chapters in the United States and England in staging 295 events. Nearly 500 volunteers are engaged in the work of their alumni chapters. Eight presidential events were held in chapters with 2 featuring former president, Ken Ruscio, and 6 introducing new president, Will Dudley. Spring Alumni Weekend attracted 646 alumni back to campus and 548 alumni registered for Young Alumni Weekend in the fall. 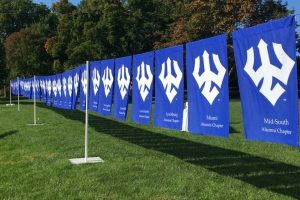 Again, the Five-Star Festival for alumni who graduated from W&L more than 50 years ago was well received by alumni in the fall and included the 55th, 60th and 65th reunion classes. Additionally, the Office of Special Programs offered numerous travel and on campus life-long learning opportunities to alumni, parents and friends. Law School Advancement coordinated 15 law alumni events across the country. Law Alumni Weekend attracted several hundred alumni and guests, many of whom contributed to the reunion class gift of $4.8 million. The record Law Annual Fund result of $1.581 million surpassed the amount called for in the Law School’s strategic transition plan – four years ahead of schedule. In addition to three issues of the Alumni Magazine and two issues of the Law School Newsletter, Communications and Public Affairs (C/PA) produced monthly issues of the electronic newsletter Generally Speaking received by more than 24,000 alumni, parents, and friends. Reflective of the importance of mobile technology, 51 percent of those who opened Generally Speaking did so on a mobile device. Communications continued to make its communication outlets accessible to all, including those with disabilities. Eight students continued the popular wluLex, a student social media team covering all aspects of campus and community life. Followers of wlunews and wluLex include 14,918 followers on Facebook, 11,698 on Twitter, 10,362 on Instagram. wluLex has 2,229 followers on Snapchat. Reflecting the importance of video in the University’s communications, there were 33 Livestreamed events, viewed by 11,592; 2,190 subscribers to W&L’s YouTube page; and 113 live video sports broadcasts, viewed by 30,805. In addition, C/PA partnered closely with the Office of Undergraduate Admissions and Financial Aid to update communications strategies and recruitment materials. It also created a comprehensive strategic communications plan to further support the work the department does to enhance and extend the reputation of the university among key audiences and influencers. Lee Chapel & Museum welcomed 39,699 visitors from the United States and throughout the world. The museum featured a special exhibit on “The Rockbridge Rifles,” a local militia unit that was founded in 1859. The exhibit highlighted the Rockbridge Rifles’ flag, on loan from the American Civil War Museum in Richmond, which has been recently restored with funds from three generous Washington and Lee alumni. More than 2,100 visitors enjoyed the University collections of ceramics and paintings housed in the Reeves Center and Watson Pavilion. The collection was also used to teach a Museum Studies course, “Washington and the Art of Leadership,” a political science course taught in conjunction with the history department, as well as guest lectures for a number of disciplines including art, history, chemistry and economics. The Watson Pavilion also had a special exhibition of World War I toby jugs (pitchers made in the likeness of WWI notables such as King George V and Woodrow Wilson). Since March the Reeves Center has undergone an extensive renovation and will re-open to the university community and the public in September. Finally, in addition to supporting the university’s on and off-campus events, the Office of Special Events oversaw the University’s two campus guest houses, Morris and Belfield.